I waited a long time for this movie, and although I didn’t want to be, I was prepared to be disappointed. I have long maintained that when I read a book and then watch the movie adaptation (or the other way round), I don’t expect it to a be a page-for-page carbon copy. What I do hope is that I will have a similar emotional response to the work of art, even if the art form itself is different. The story should be largely the same, although it is expected and even desirable to have certain scenes and characters added and omitted so that the storyteller can tell their version of the story so that it resonates with power and poignancy. Each art form has its own inherent strengths and weaknesses, and the storyteller — author or director — must decide best how to use the medium at hand to convey subtleties of the story. At their core, books use words to tell a tale, and films use moving pictures. 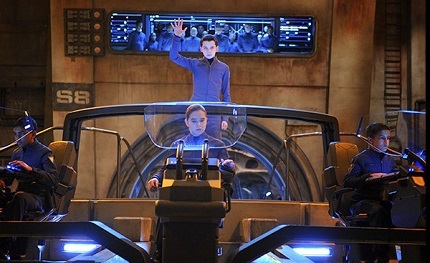 It is, then, a rare thing when a movie manages to capture our imagination with both words and pictures; Ender’s Game succeeds on both counts. Director Gavin Hood effectively captures the essence of Orson Scott Card’s beloved book, bringing it to life on the big screen with a bevy of acclaimed actors and believable special effects that could not have been realistically realized a decade ago. The gist of the story is that in Earth’s near future, but some 50 years after the Formic Wars, Earth is preparing again for war. The Formics are an alien race that attacked Earth, but because of the heroic actions of Commander Mazer Rackham in the midst of a seemingly hopeless battle, the Formics were defeated. Now, decades later, the International Military is bracing for what they believe is another inevitable invasion from the Formics, who have clearly been growing in strength and number since the war. Recognizing that their earlier victory was the result of some brilliant but unorthodox tactics, the IM has turned their attentions to their best hope for capturing lightning in a bottle twice: children. The brightest children are identified in grade school, and their activities and thought processes are monitored with a small chip in the base of the neck. From these, the most apparently gifted strategically are recruited to Battle School, an orbiting space station with an enormous, zero-gravity battle room where increasingly difficult war games are played. And this is the window through which we first see Andrew Ender Wiggin. He is a strategical prodigy, showing flashes of brilliance from a very early age, and consequently arousing the general interest of the IM, and specifically the interest of Colonel Graff. Ender is also painfully shy and introspective, and he is often bullied, first at home (by a cruelly abusive older brother, Peter) and also at school. His older sister, Valentine, is closest to Ender, and her compassion for her brother sustains him at times when he feels most alone. Although naturally gifted in tactical thinking, it is from his siblings that he learns both how to sympathize and empathize with his enemy, as well as how to destroy them with ferocity and finality. Colonel Graff ultimately drafts young Ender into Battle School, and a new round of physical and mental abuse begins for the new recruit as he learns to navigate the complicated and confusing minefield of power and politics that is innate in the military. Graff is convinced that Ender is the one who can ultimately lead their forces to victory against the Formics, while Major Anderson has her doubts about his readiness. As the impending conflict looms, Ender and his adolescent army are pushed beyond reasonable limits to prepare for war against an enemy they barely understand, and the fate of the world rests in the hands of a child. If I have any real complaints about the way the story unfolds on the screen, it’s that the movie seems to have two consecutive endings, and the first one takes a little bit of the oomph out of the second one. Without revealing anything, I can only say that I wish that the two significant plot points had been better amalgamated. Colonel Graff is played with steely-eyed finesse by Harrison Ford. Asa Butterfield plays young Ender, and his skinny frame and doe-eyed face belie his true age. In the book, Ender is younger, but excellent casting of the other students and cadets make Butterfield feel smaller and more vulnerable than his actual years. Ford and Butterfield have a rare and complicated chemistry onscreen, and volumes are communicated between them with a sparsity of words. Viola Davis and Ben Kingsley give stellar, supporting performances, but then again, they always do. Nonso Anozie is a very imposing Sergeant Dap, with a fleeting smile behind his eyes that is at once charming and disarming. There are too many amazing young actors to mention them all, but casting was exceptional. Of particular note was Abigail Breslin (Valentine Wiggin), who has come a long way since winning audiences with acute cuteness in Little Miss Sunshine, and Hailee Steinfeld (Petra Arkanian), who has a couple of dozen film credits to her name, but who first blew me away in the Coen brothers’ 2010 True Grit as Mattie Ross. Not having read the book, one might assume that this is a movie about a futuristic war in outer space, about alien armies and rocket ships and laser beams. But one would be wrong. This is a movie about a boy. It just so happens that he has grown up in a world on the brink of interstellar war, a conflict that he has been sucked into through no fault of his own. This is a story about relationships and families and friends, and how those interpersonal interactions help form our own personalities and prejudices. We learn how the people we are related to instill in us the very best and the very worst attributes through years of shared experiences, and we must then pick and choose the bits and pieces that we will hold onto, and the ones that we should like to discard. We come to realize that just as we do not pick our families, we rarely get to choose the people we work with or for, nor do we often get a say in the tasks that are given us. But we do get to decide how we respond to those individuals and to those situations. The story is immediately insightful about a host of habits that, left unchecked, can ultimately destroy us. We see the danger of judging others too quickly without getting to know them, and the futility of subscribing to a might-makes-right doctrine. The ugliness of bullying and belittling others for the sake of self-aggrandizement is revealed for the monster that it is, and we also observe how a soft answer turneth away wrath. We often watch movies to be entertained, to escape from the problems of our own lives and enjoy somebody else’s for a few hours. We also like to learn things, to gain insight and perspective, to walk a while in someone else’s shoes. The very best movies offer us both; they captivate our attention even as they challenge assumptions. Watch this movie with your kids, then talk about it. Look for reflections of yourself in the characters on the screen. Ask questions, to your family and yourself, and see if you don’t see things a little differently than you did before. Ender’s Game reminds us that we can’t simply judge our lives based on what we do; we must consider why and how we make those choices. That is what matters, and that is why Ender’s Game matters.